Well, this isn’t a normal “house update”. The house was updated, but with a few thousand pound branch that crushed my truck, scratched Chrissy’s car, and took off my brand new gutters. 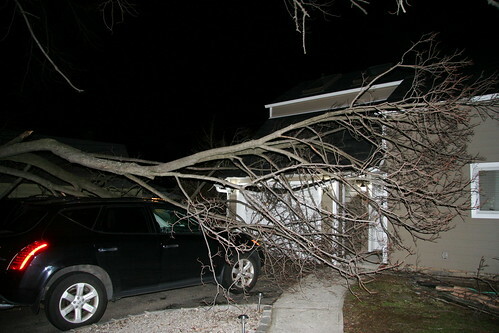 Below are some pictures, it happened at about 10:45pm (about an hour and 1/2 ago) on 3/8/2008. I reported 3 claims (yes three) to Allstate. They made me do one claim per car, then one for the house. I’ve herd some horror stories in the past with claims of this nature with Allstate, lets just hope they handle everything correctly. I do have a question for everyone, this was a branch from my neighbors tree. What do I do? Who’s responsible for the tree cleanup and all of the other expenses? Yes, the tree is IN my car! Roof is crushed in, windows smashed, quarter panel is smashed….